Most content pages on Trailforks have a "flag" button at the bottom. This can be used to flag/report that content to the site and regional moderators. This is one way to draw attention to illegal trails for example, or report a photo attached to a wrong trial. It's helpful to include notes in the flag form. 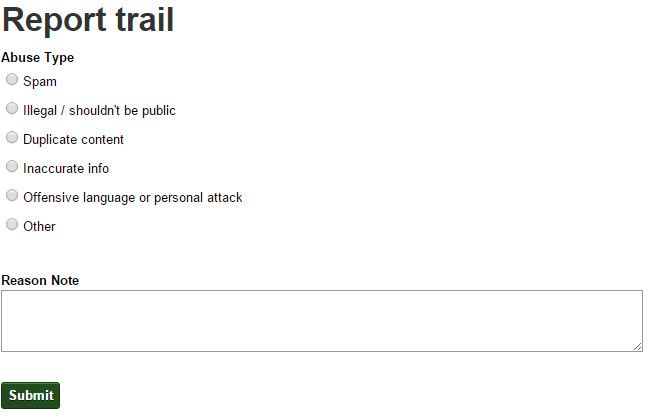 For illegal trails you can also edit the trail itself and change its status to hidden. We prefer to keep illegal trails in our database and keep them hidden, rather than deleting them completely. Read more about this here.